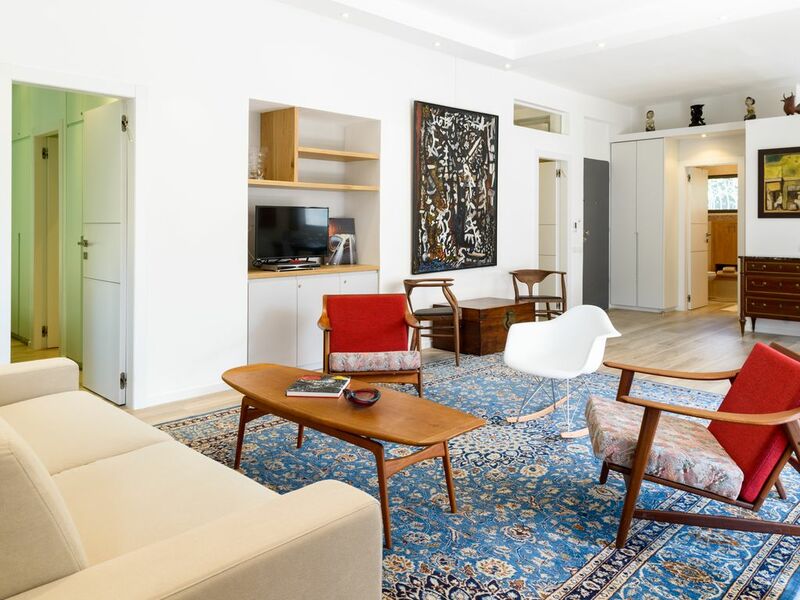 This luxury, quiet, spacious (100 sqm) and comfortable boutique apartment is ideally located at the corner with Ben Gurion St., 200m from Dizengoff St. Just 10 min walk to the beach, it is one block from the lively neighborhood of Ben Gurion/Dizengoff (restaurants, bars and shops). Exceptionally well connected to the city’s public transportation services (Arlozorov/Ibn Gabirol/Dizengoff), you will be able to enjoy all of Tel Aviv city's facets! The apartment was fully renovated to a very high standard. The renovation resulted in a perfect combination of authenticity and contemporary, and created the sense of the French charm in the heart of Tel Aviv. On the 2nd floor of a classified building (no elevator), the apartment sleeps up to 6 people over 2 very large bedrooms with queen-size bed in each and a very comfortable double-sofa bed in the living room. The open plan living space connects the living room, the office corner, the dining area and opens onto the kitchen. The kitchen is fully equipped with gas cooktops, oven, dishwasher, Nespresso machine, etc. We are happy to provide you with a 24/7 private parking spot! Exceptionally well connected to the city’s public transportation services (Arlozorov/Ibn Gabirol/Dizengoff): 10’ to Jaffa with bus 10; 10’ to Shuk Hacarmel with bus 22; 7’ to Arlozorov Central Bus & Train station with bus 61 and 161; 25’ to Herzliya marina with bus 90. Self-service bicycle rentals station around the corner. You will enjoy a SuperSal hypermarket 100m away! Home is not a set house, or a single town on a map. It is wherever the people who love you are, whenever you are together … Home is people, not a place ... Home is a moment, and then another one, building on each other, like bricks, to create a solid shelter … Home is what you take with you wherever you may go. Life takes you to unexpected places, then love brings you Home … Home is where the heart is! What we love most about our Homes, is who we share them with! Believe it or not, our Homes notice when you are no longer there … and they long for you to come back again … with love! We strive to create true Homes from Home for you, charming gems with attention to every detail, infused with a friendly atmosphere of genuineness, sharing and tasting. We look forward to welcoming you at Home! You will warmly be greeted by Elie & Carole, two very friendly hosts who will care of you during your whole stay. They speak English, French, Spanish and Hebrew. Attractive apartment; nicely furnished and comfortable. This is a good property for a short term rental. The apartment is light, with a nice balcony; well furnished and nicely located. We stayed for two weeks and were pleased with the accommodation. An added benefit is that the rental agent stayed in contact and made sure that there were no issues. I have no reservations with recommending this apartment. a truly wonderful home, spacious, well appointed and spotless, elie and carol know how to make guests welcome and offer very useful advice to make the most of a tel aviv holiday. we could not have wished for more, all our expectations were far surpassed and made our stay a wonderful experience. we can recommend this place to all visitors who can appreciate hospitality at the very best. thank you elie and would love to stay with you again! We tend to be skeptics but in this case the VRBO description is dead on. The apartment is comfortable and in immaculate shape (very recently renovated in a modern style with nice art and new appliances), you couldn’t ask for a better location, and even close to the biggest supermarket I’ve ever seen in Tel Aviv, plus a ton of nearby restaurants and specialty stores. We thoroughly enjoyed our stay in French Charm while visiting family in Tel Aviv. The apartment is attractive, clean, well-furnished, and comfortable - with a great kitchen. The location is within walking distance to restaurants, shopping, beach, and many Tel Aviv attractions. Elie and Carole were most welcoming and informative. Arriving middle in the night still everything is ready, cosy and high standard. The place is light and spacy with lots of taste. Silent street and in a foot walk to the never sleeping Tel Aviv . Back soon! Nous avons passé un superbe séjour dans ce très bel appartement . Nos hôtes nous ont accueillis avec chaleur et gentillesse. L appartement est pratique, joliment décoré et avec tout le nécessaire pour une petite famille. Les commerces sont deux pas. L emplacement de l appartement est à la fois central et pas loin de la plage. Nous avons hâte d y retourner... À très vite. Exceptionally well connected to the city’s public transportation services (Arlozorov/Ibn Gabirol/Dizengoff): 10’ to Jaffa with bus 10; 10’ to Shuk Hacarmel with bus 22; 7’ to Arlozorov Central Bus & Train station with bus 61 and 161; 25’ to Herzliya marina with bus 90. Self-service bicycle rentals station around the corner. You will enjoy a SuperSal hypermarket 100m away!